Golden Cruise is proud to welcome you onboard its luxury boats for a Five Star Cruise in Halong Bay! Visiting the most famous Vietnamese World Heritage Site with Golden Cruises is bound to be one of the highlights of your travel itinerary in Vietnam. Thanks to the high-quality of our facilities and accommodation and the excellence of our customer services. The architecture of our vessels draws its inspiration from the traditional Halong Bay junks. They have been furnished and designed to offer the utmost comfort worthy of a world-class luxury hotel and the enchanting charm of a boutique hotel. Fostering a customer centred culture al all levels, we are committed to provide the highest standards of service to offer you an idyllic rendez-vous with the breathtaking scenery of Halong Bay. Start your paradise journey here, you are only a click away from fulfilling your dreams! 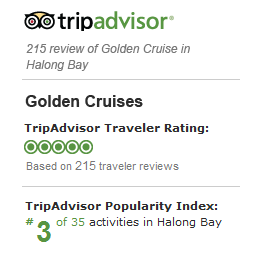 Golden Cruise is proud to welcome you onboard its luxury boats for a Five Star Cruise in Halong Bay! Visiting the most famous Vietnamese World Heritage Site with Golden Cruises is bound to be one of the highlights of your travel itinerary in Vietnam. Thanks to the high-quality of our facilities and accommodation and the excellence of our customer services. The architecture of our vessels draws its inspiration from the traditional Halong Bay junks. They have been furnished and designed to offer the utmost comfort worthy of a world-class luxury hotel and the enchanting charm of a boutique hotel. Fostering a customer centred culture al all levels, we are committed to provide the highest standards of service to offer you an idyllic rendez-vous with the breathtaking scenery of Halong Bay. Start your paradise journey here, you are only a click away from fulfilling your dreams !